Summer side dishes can seem limited at times and you might get tired of having the same old options of potato, coleslaw, salad, baked beans and the like. Everyone once in a while you just want to try to spice things up a little bit and try some new twists on old favorites so you can experience some new flavors and get ideas for future meals. Potato salad is one of those things that every family seems to have a basic recipe that they fall back on and pass down from person to person. I know I have made the same potato salad for years and was looking for a new way to spice things up a little bit and add some great flavor to this dish when I was making burgers the other night. I came upon this recipe in searching the Internet from a blog called Pass the Sushi and saw a posting for whiskey burgers and zesty potato salad. 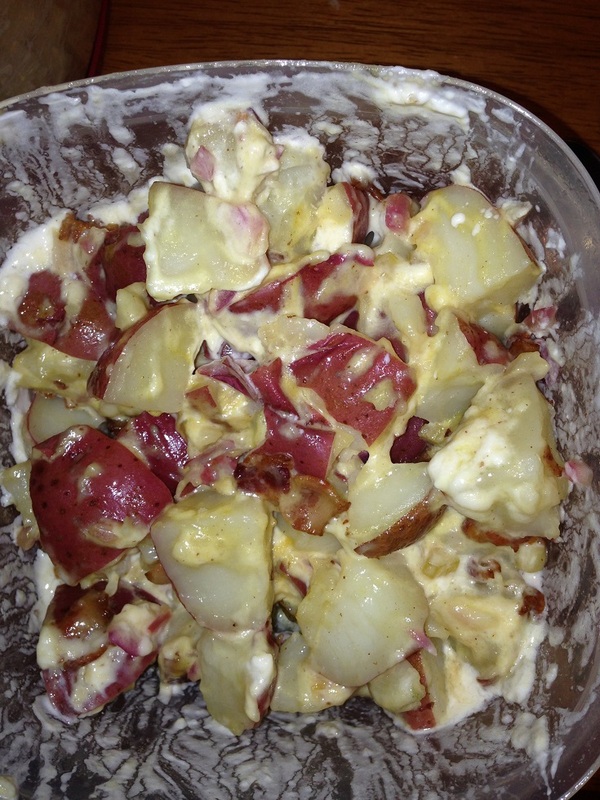 I decided to give both a try, and I am posting the zesty potato salad recipe first for you to take a look at. Place the potatoes and the smashed garlic in a large stock pot. Fill the pot with water to about 2 inches above the potatoes and generously salt the water with the kosher salt. Bring the water to a boil over high heat. Reduce the heat to medium and simmer the potatoes until they are fork tender, about 10 to 12 minutes. Meanwhile, heat the olive oil in a large skillet set over medium heat. Cook the bacon, stirring occasionally, until the bacon is browned and crispy, about 10 minutes. Remove the skillet from the heat and stir in the red onion, diced celery and the red wine vinegar. Season the mixture with salt to taste. Drain the cooked potatoes from the stock pot and transfer them to a large bowl. Remove the garlic and throw it away. Add the bacon mixture to the hot potatoes and toss the mixture with the potatoes until the potatoes are well coated. Gently fold in the mayonnaise and the Dijon mustard until they are blended well into the potato salad. Refrigerate the potato salad until it is cold and serve. To me, this is very close to have a colder version of German potato salad with the mix of the bacon, onions and vinegar with the potatoes, but you also get the flavors of the Dijon mustard and the mayonnaise added to it as well for some extra tang. The potato salad was very good, but it got even better the longer it sat in the refrigerator. We had some again with lunch the next day and it tasted even better than the first time. I really liked this recipe and I will definitely be using it again for barbecues or summer parties, though it does need to be refrigerated because of the mayonnaise so you need to be careful about leaving it out.